Thanks, guys, for all this information. That's loads to be getting started with. A bit daunting, even, but don't take that as a complaint. And thanks, Theblazeuk. Without having looked at it yet I was wondering whether all the open source material meant it wasn't strictly necessary to have any specific Dredd/SD source book since all the material/background for a scenario can be gleaned from the comics. After reading your conversion tips I'm thinking the GURPS system that the GamesMaster already knows could be used to accommodate a Dredd scenario of my own making. Otherwise the players would have to learn another set of rules. Seems like there's tons of ways to do it without having to fork out too much. The rulebooks I mentioned wouldn't have anything setting specific, they're all about the mechanics of the games. You're supposed to have the Dredd, SD or Slaine books and the players handbook (PHB) for 3.5, but the freely-downloadable one can replace the PHB. SRD: System Reference Document (released under the OGL: open gaming licence). I would never have imagined how much in-depth reference material was required for this. The only core books available where I live for the characters I'm interested in are based on Traveller. It might be worth waiting for the new 2000 AD RPGs to come out and see how they are received before committing the time to understand it well enough to play. I would need to understand it in detail to convince the gaming group it was worth it. These are people who spent 10 mins in character bickering about whether it was better to visit the Land Registry or Civic Library first during Call of Cthulu. You are playing Call of Cthulu absolutely correctly in those cases! DnD is easy to use and you don't need the books to run, can easily do with the SRD available online. The only drawback with DnD would be that it's v.geared towards magic, combat and adventure - not say, being a Judge or a Dog. No apologies needed, it just heightened the enthusiasm. Will any of you be getting the new 2000 AD RPG material or would be a case of learning yet another system? I like the fact the first book will be self-contained. In some ways (basic stats) GURPS is a little like D&D/D20. I'd say GURPS and D&D (any edition) are very, very different beasts. In some way, GURPS could be a good fit, as in theory it's adaptable to your vision of a setting, but the apparent level of detail and number of options can be off-putting even for experienced gamers. They only spent ten minutes bickering? Quite a fast-moving group then? We did but my character, a disturbed WWI veteran with alcoholism as a character disadvantage, ended up in the pub getting wasted after failed dice rolls testing my will. Don't split they party! Pity the poor GM! That makes CoC a bit weird though as 2 war veterans, a private detective and a socialite all hang around the library waiting for the professor to spend 7 hours looking for the works of a 15th century architect. Always split the party! No, no, no... you need to go to the Land Registry first to research where you're going, then the Library - as any PC sufficiently skilled in Research based abilities will be far too insane following a visit to a CoC Library to successfully find anything out at a map based place. You can also find a bundle of GURPS Traveller Wars for more bloodshed, which seems suitable for the Tooth. Here is Lobo with a very high experience score, and me with practically zero xp, talking about the JD RPG. 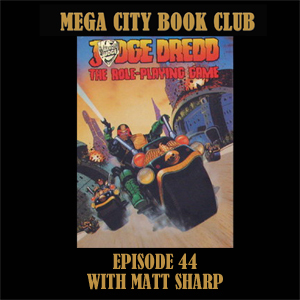 Preview of a page from the forthcoming Judge Dredd and Worlds of 2000AD game.